TMC offers a range of 2U Ultra Servers, listed below. 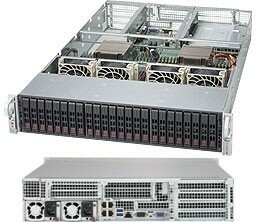 Among these are the Rackmount Server and Supermicro SuperServer with Hot-swap Drive Bays, Integrated Quad GbE. and Redundant PSUs. The Supermicro 2029U-E1CR4T SuperServer is a 2U Rackmount server with 24 2.5" Hot-swap Drive Bays, 4x 10GBase-T LAN ports via Intel X710 and 1000W Redundant PSU. The Supermicro 2029U-E1CR4 SuperServer is a 2U Rackmount server with 24 2.5" Hot-swap Drive Bays, 4 1GbE LAN ports via Intel i350 and 1000W Redundant PSU. The Supermicro 2029U-E1CRT SuperServer is a 2U Rackmount server with 24 2.5" Hot-swap Drive Bays, 2x 10GBase-T LAN ports via Intel X540 and 1000W Redundant PSU. The Supermicro 2029U-E1CRTP SuperServer is a 2U Rackmount server with 24 2.5" Hot-swap Drive Bays, 2 10G SFP+ Ethernet ports and 1000W Redundant PSU. 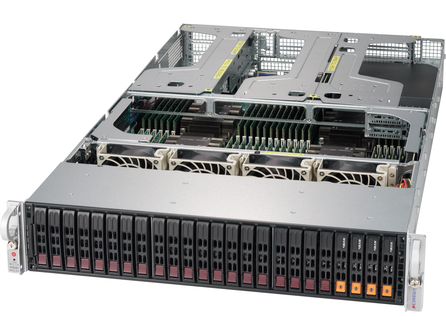 The Supermicro 2029U-E1CR25M SuperServer is a 2U Rackmount server with 24 2.5" Hot-swap Drive Bays, 2 25GbE SFP28 Ethernet ports and 1000W Redundant PSU. The Supermicro 6029U-E1CR4T SuperServer is a 2U Rackmount server with 12 3.5" Hot-swap Drive Bays, 4x 10GBase-T LAN ports via Intel X710 and 1000W Redundant PSU. The Supermicro 6029U-E1CR4 SuperServer is a 2U Rackmount server with 12 3.5" Hot-swap Drive Bays, 4 1GbE LAN ports via Intel i350 and 1000W Redundant PSU. The Supermicro 6029U-E1CRT SuperServer is a 2U Rackmount server with 12 3.5" Hot-swap Drive Bays, 2x 10GBase-T LAN ports via Intel X540 and 1000W Redundant PSU. 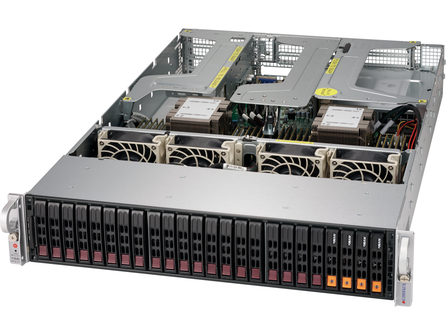 The Supermicro 6029U-E1CR25M SuperServer is a 2U Rackmount server with 12 3.5" Hot-swap Drive Bays, 2 25GbE SFP28 Ethernet ports and 1000W Redundant PSU. 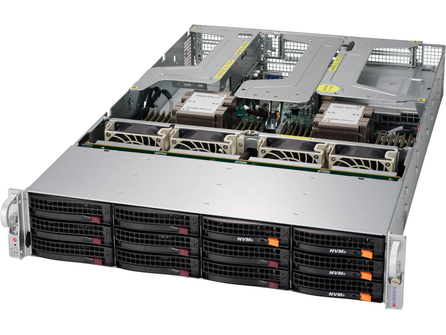 The Supermicro 2049U-TR4 SuperServer is a 2U Rackmount server with 24 2.5" Hot-swap Drive Bays, 4 GbE and 1 dedicated IPMI LAN ports and 1600W Redundant PSU. The Supermicro 6029UZ-TR4+ SuperServer is a 2U Rackmount server with 12 Hot-swap 3.5" drive bays, 4 Gigabit Ethernet ports and 1600W Redundant Power Supplies.